The dreaded question that hangs over my head EVERYDAY…Whats for dinner? This question is a pain in the rump! Lately, I have become more involved in connecting with other parents and visit a few online forums. I had noticed an open chat about the importance of shared family mealtime and weighed in on how I felt about the issue. Thanks to Everything Mom and Swiss Chalet I had the WFD question answered for me. After participating in the online convo at Everything Mom, my name was picked to receive a $50 Swiss Chalet gift card. I was thrilled to win, and even more thrilled that it would take a little pressure off me for at least one meal. The gift card arrived in perfect timing. Our busy life had become more chaotic when my husband’s grandmother entered hospital. My hubby and I work opposite hours to avoid childcare fees, we each have volunteer commitments, and now added visiting sweet Nan to the crazy schedule. One day before heading to work, I didn’t want to leave my WFD question until that afternoon. 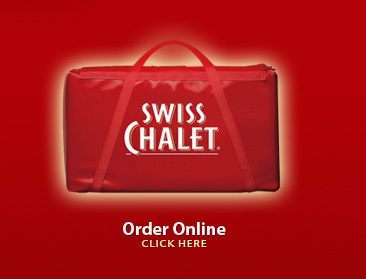 I went on the Swiss Chalet website and discovered that I could pre-order our meal and get it delivered or choose the take-out/pick up option. In a few clicks I had a Chicken and Rib Family Meal reserved for pick up at 6 pm. It was a welcome treat after a crazy busy week. Even better? There was very little clean up. We had enough food left for lunch the next day. And we still have ‘money’ left on the gift card to fund another meal. Connecting with other parents on Everything Mom fed my need for social interaction. Swiss Chalet fed our bellies and made a very happy mommy. *This blog is the authors genuine account of winning a contest and is not endorsed or sponsored by Everything Mom or Swiss Chalet. Posted in Blah Blah Blogs, Products, Stuff I Love and tagged busy, chats, choices, contests, delivery, dinner, family, forums, healthy, husband, online, parenthood, parenting, restaurant, schedules, take out, toddlers, work. Bookmark the permalink.